Hisham's Palace - What Do You Know About Hisham's Palace? 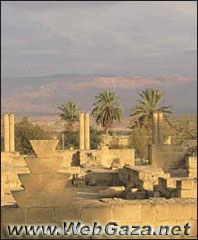 Qasr Hisham (Hisham's Palace) is just five kilometres north of Jericho. The palace was a country residence, built in AD 743 by Al-Walid Ibn Yazid, although it owes its name to his uncle, the Umayyad caliph Hisham Ibn Abd Al-Malik, who ruled an empire stretching from India to the Pyrenees. Hisham, like most early Umayyad rulers, preferred the freedom of the desert to life in the capital city Damascus. The palace is a complex of residential quarters, baths, mosques, and colonnaded courts. Its mosaics and stucco ornaments are fine examples of early Islamic architecture. Experts believe that an earthquake destroyed the palace before it was completed. Thus the accumulated sand and debris helped to preserve the palace's lovely mosaics. The mosaic floors of the baths are a major attraction, but the Tree of Life or the Tree of Human Cruelty is one of the most beautiful mosaics in the Near East. Its vibrant green and gold colours are just astounding, as is its subject. Many of the carved stuccos from the palace are displayed at the Rockefeller Archaeological Museum in Jerusalem.